Maintaining your eyebrows can be a hassle in and of itself. There’s threading, waxing, tweezing and sometimes, even bleaching…. Yikes! It takes a lot to pluck your hairs to perfection and style them with every intention of stepping up your brow game. However, makeup artists and social media have opened up the floodgates for novices like us, proving that we can (and sometimes should) go beyond the basic fill-in, trim and set. Attaching foil, scattering pigments and laying on a thick layer of paint are only a few methods used to create these avant-garde looks posted on the ‘Gram. These Instagram accounts shared some of the most mind-blowing, editorial brow looks that we’re still mesmerized by. 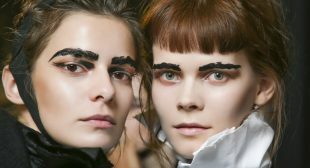 Get some inspiration for your next brow venture with these undeniably innovative looks ahead!